A new to me blogger from this past year, Jennifer of Mother Thyme is joining us today with a sweet treat. 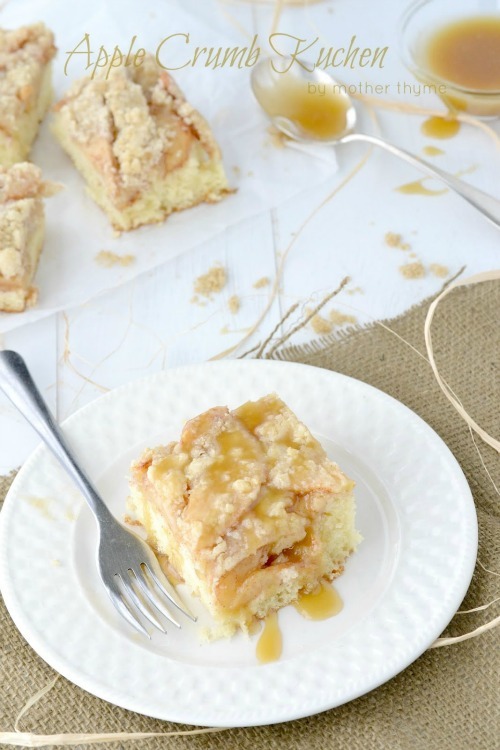 I’m not sure I’ve ever had an apple cake, but topped off with a caramel drizzle… there should be no other way! If you’re not familiar with Jennifer’s blog, be sure to stop by. She has a lovely collection of recipes and amazing photography to go along with it. Hey everyone! 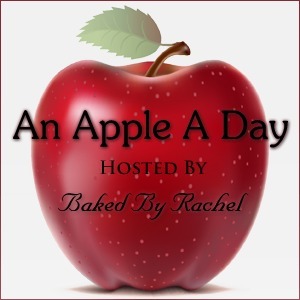 I am thrilled to be sharing one of my favorite apple recipes here with you today. Fall is my favorite time of year. From the changing of the leaves, to the brisk autumn days, I embrace each day of the season. What I look forward to most is tossing on my favorite cozy scarf, pulling on my worn boots and heading off to the apple orchards with my family to pick bushels of apples to make all sort of goodies with. On the top of my list of things to make is my Apple Crumb Kuchen. Kuchen which is German for cake is a family favorite. It stems back to my great great grandparents that I know of. Our family often serves kuchen, especially on holidays. It brings back fond memories of growing up, my family and traditional recipes I look forward to passing on to my kids. 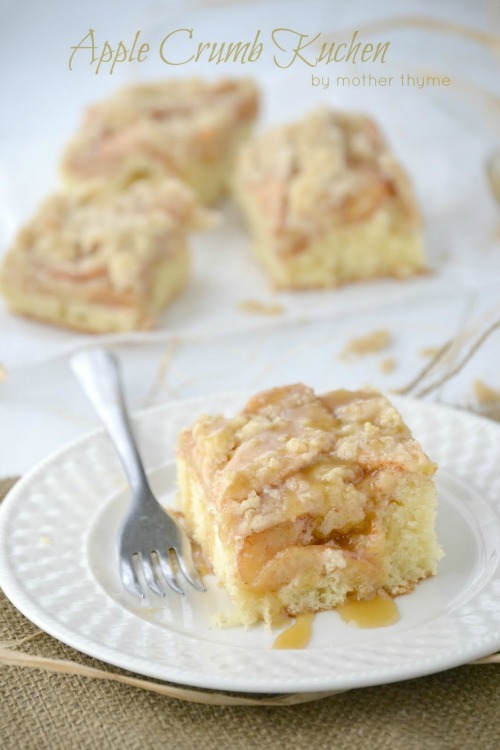 This recipe is easy to make and only takes about three large apples. I like to use Crispin or Golden Delicious for baking but there are times when I just use whatever I have on hand. To top it off I drizzle a little warm salted caramel on top which is completely optional, but why not, right? 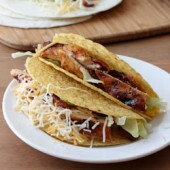 I hope you enjoy this recipe as much as I do and this becomes a traditional family recipe for you as it is for me. Preheat oven at 350 degrees Fahrenheit. Grease and lightly dust a 9” x 13” cake pan with flour, tapping off any excess. Set aside. In a small bowl combine flour, brown sugar and butter and mix together with a pastry blender or fork until butter is the size of peas. Set aside. In a small bowl combine apple slices with a splash of lemon juice. 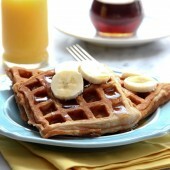 Toss with sugar and cinnamon and set aside. In a medium bowl stir together flour, baking powder and baking soda. In a large bowl with an electric mixer cream butter and sugar on low speed. Stir in eggs one at a time. Add in vanilla. Gradually add in flour mixture, alternating with some of the sour cream until all blended. Pour into prepared cake pan. Stick apples lightly into top of dough. Sprinkle with crumb topping. Bake in preheated oven for 45 to 50 minutes until it pulls away from the side of the pan. In a medium saucepan combine butter, brown sugar and half and half. Stir occasionally over medium heat until butter is melted and sugar is dissolved. Bring to a boil and stir frequently for 2-3 minutes. Remove from heat and stir in salt. Use to drizzle on top of cake when serving. You can find Jennifer on Facebook and Twitter. 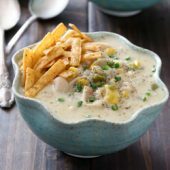 Check out a few more of Jennifer’s recipes: Chicken pot pie, Parmesan chicken tenders and Apple pie smoothie. I love everything about this cake, beautiful photos, Jennifer! I love family recipes. PS – my family is German too! This looks so fantastic! 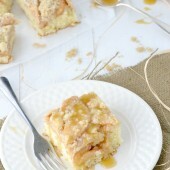 Love the apple slices peeking out on top and of course the caramel drizzle! I’ve never had a kuchen, but this looks sooo good!! I love Jennifer – such a great blogger! !